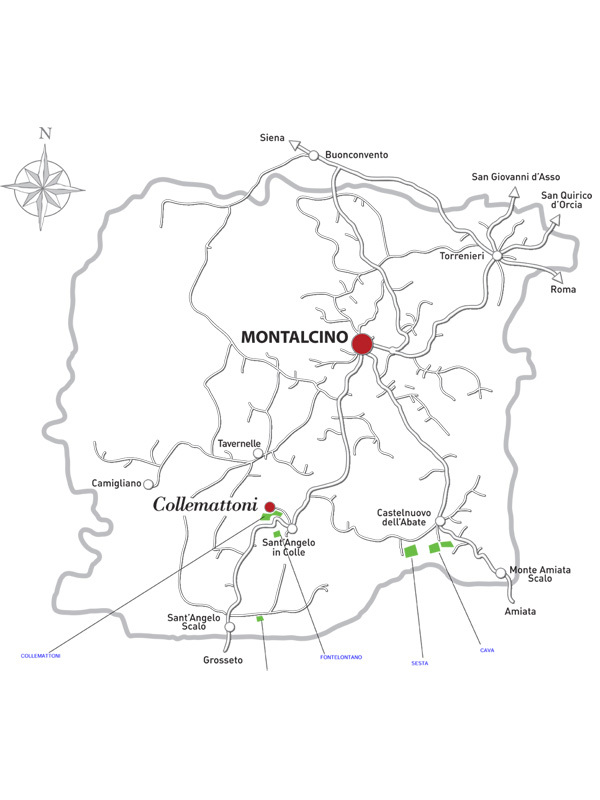 The Collemattoni winery currently features around 11 hectares of vineyards, mostly Sangiovese, in five different areas. Collemattoni Vineyard (with less than 2 hectares) is near Sant’Angelo in Colle at 420 meters above the sea level, surrounding the main buildings of the estate and representing the heart of the winery. Fontelontano Vineyard (around half hectar) is located between Sant’Angelo in Colle and Collemattoni at 380 meters above the sea level. The name is linked to the presence of water source where in the old times people use to get their water for their homes. The Brunello di Montalcino Riserva is produced from this vineyard only in the best vintages. Fontelontano vineyard dates back to 1984 and is the oldest vineyard at Collemattoni. Sesta Vineyard (2,70 hectares) is located between the towns of Sant’Angelo in Colle and Castelnuovo dell’Abate on a slight slope opposite Monte Amiata at 350 m above the sea level. Cava Vineyard (1,80 hectares) is located in Castelnuovo dell’Abate in an alabaster quarry (locally called onyx). The local quarry was used to build the Romanesque Abbey of Sant’Antimo. Orcia Vineyard (around 4,5 hectares) is located near Sant’Angelo in Colle. Here we also produce some Trebbiano and Canaiolo varieties.